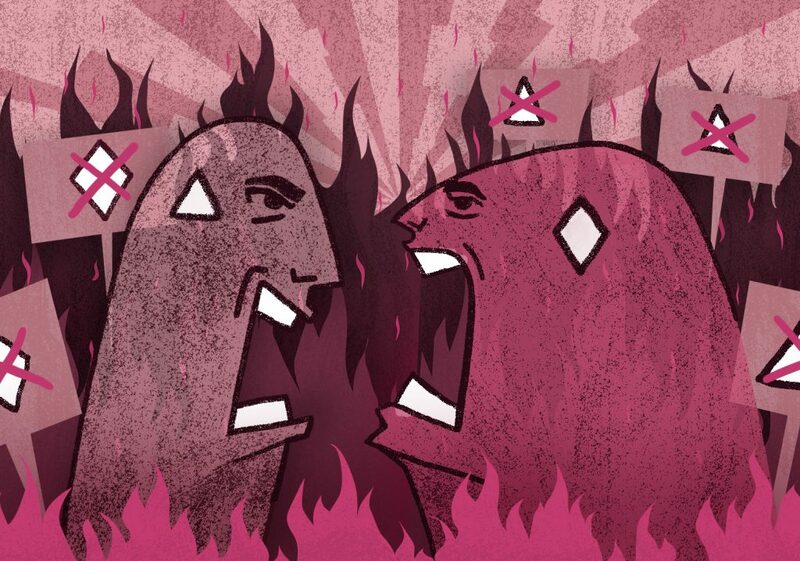 The shared goal of extremist actors across different ideologies is to bring about radical political or societal change, often through the strategic polarisation of society. The adoption of meta-political campaigns such as disinformation and media manipulation campaigns or militant strategies such as terrorist attacks and hate crimes serve merely as a means to an end (Atwan 2015; Davey and Ebner 2017). This end is in many cases the accelerated escalation of existing inter- and intra-community tensions to a global civil war, based on the idea that a war between religions, cultures or races is inevitable and imminent. This briefing focuses on the interplay between the narratives and strategies of Islamist and far-right extremists, with an emphasis on the digital space. It presents the main arguments and findings of two recent pieces of research on the topics of cumulative extremism and reciprocal radicalisation: a.) the book “The Rage: The Vicious Circle of Islamist and Far-Right Extremism” (I.B. Tauris, 2017) and our upcoming ISD report in cooperation with the German Institute for Democracy and Civil Society (Fielitz et al., 2018). 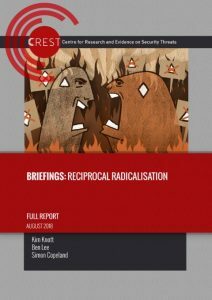 The intertwinedness of the narratives and strategies of Islamist and far-right extremists is a burgeoning subject of interest to academics, policymakers and frontline workers who seek to mitigate the self-destructive forces that terrorism can set free within the societies it strikes. In order to study the ways in which extremists on both the Islamist and the far-right side of the spectrum have been able to capitalise on each others’ actions and words, we used a combination of terrorism data analysis, field studies, digital ethnographic research and interviews with extremists and formers for our research projects. The results suggest a mutual dependency between Islamist and far-right extremists, because they rely upon the other to reinforce their narratives online. Strong Interplay between Contents: Our discourse analysis of more than 10,000 Islamist and far-right posts revealed a strong interaction between the narratives of both extremes. By frequently employing victimhood and demonisation narratives and normalising the idea of an imminent civil war Islamists and far-right extremists rhetorically validate each other. To illustrate this interplay, we detail what our empirical data revealed to us about the role Islamist extremism plays in the far-right’s rhetoric and of the far-right plays in Islamist extremist rhetoric. Of a total of 6,190 analysed posts from far-right Facebook pages (including comments), 5,945 contained key words that expressed victimization and demonization narratives based on Islamist violence directed towards the West. An analysis of these key words showed that “Islamist extremism” comprised more than half (54 percent) of all identified victim and foe narratives. The idea of an insidious Islamisation – often linked with the allegation of an “invasion” – was likewise seen to be a significant threat (16 percent). Apart from that, “mass immigration” assumed a relatively high position within the discussions. Here, a distinction can be made between posts that spoke of a “immigration problem” and those that referenced acts of violence committed by migrants (7 percent). While fears of a demographic (e.g., ethnic) “replacement” were only explicitly discussed in less than 1 percent of the analysed posts containing victimhood narratives, 6 percent concretely addressed the danger of a civil war between “original Germans” and immigrations or Muslims. The quantitative analysis of the key words was supplemented with a qualitative analysis of far-right extremist posts on Facebook, Twitter and Discord in order to also collect content that was not text based. Our observations here likewise confirmed the strong emphasis placed on the demonisation of refugees and Muslims, who are associated with terrorism, and a victimisation of the “nation” or “European civilisation”. In 5,163 social media posts (including comments), we found a total of 1,877 key words emphasising one’s own victimhood and the image of a hostile West. In the Islamist networks, more than half of all victim and foe narratives made reference either to perceived hate directed against Muslims (42 percent) or against ethnic minorities or racism (13 percent). A total of 24 percent spoke of oppression and persecution of Muslims and 12 percent addressed experiences with discrimination. The reference to historical victim narratives, such as the crusades and crusaders, accounted for around 4 percent, while present-day right-wing populist parties such as the Alternative für Deutschland (AfD) and far-right extremist movements such as Pegida were mentioned in 5 percent of victimhood content. A supplementary qualitative analysis of Islamist rhetoric in social networks and applications confirmed the central role of victimhood narratives in reference to far-right extremism and anti-Muslim hatred. The observed Islamist groups shared videos of European right-wing populists, images of far-right extremist demonstrations, articles about violence against Muslims abroad and experiences with discrimination from everyday life in Germany. These articles were accompanied by statements such as “Day after day, the aggression against our religious community increases” and “It’s not about Salafists, extremists, jihadists, etc. Awake, o you Muslims and do not let yourselves be manipulated. They hate Islam! In addition to the interplay between the narratives of Islamist and far-right extremists, we discovered further interesting patterns about their interactions, or lack thereof, on the personal level and the way they react to significant events. Limited direct Interactions: The majority of all registered interactions between far-right extremists and Islamists were indirect: they often spoke about, but rarely with each other. References to the other side of the extremist spectrum were especially common in reaction to political events, demonstrations and acts of violence. Far-right posts about Islamists and Islamist posts about the far-right primarily served as a means to present oneself as the victim and construct a bogeyman (about the importance of Islamism as a mobilisation resource for the far-right: Häusler 2014). Strong Far-Right Reactions to Islamist Events: The analysis of more than one million anti-Muslim posts between the beginning of 2013 and the end of 2017 revealed significant spikes in the volume of anti-Muslim contributions on social media in the aftermath of Islamist terror attacks. Additionally, the basic level of anti-Muslim posts rose with almost every attack (similar findings in Miller, Smith and Dale 2016; Miller Smith 2017). Strong Islamist Reactions to Far-Right Events: Our observation of pro-IS and pro-Al Qaida groups also showed clear Islamist reactions to far-right events and activities. Both far-right demonstrations as well as political events such as the electoral success of the AfD were used to reinforce the image of the anti-Muslim West and use it as a recruitment tool (about the importance of racism for Islamist recruitment: Wiktorowicz 2005). Our results illustrate the interdependent relationship between far-right extremists and Islamists. Since the respective enemy is necessary for the propagandist purposes of lending credibility to their narratives and legitimacy to their activities, the two extremes need each other. Atwan, Abdel Bari (2015): Islamic State: The Digital Caliphate. London: Saqi. Bartlett, Jamie; Birdwell, Jonathan and Mark Littler (2012): New Face of Digital Populism. Demos. London. Bartlett, Jamie; Birdwell, Jonathan (2013): Cumulative Radicalization Between the Far-Right and Islamist Groups in the UK. A Review of Evidence. Demos. London. https://www.demos.co.uk/files/Demos%20-%20Cumulative%20Radicalisation%20-%205%20Nov%202013.pdf. Bartlett, Jamie; Littler, Mark (2011): Inside the EDL. Populist Politics in a Digital Age. Demos. London. https://www.demos.co.uk/files/Inside_the_edl_WEB.pdf?1331035419. Busher, Joel; Macklin, Graham (2015): Interpreting “Cumulative Extremism”. Six Proposals for Enhancing Conceptual Clarity. Terrorism and Political Violence 27 (5), S. 884–905. Ciftci, Sabri (2012): Islamophobia and Threat Perceptions. Explaining Anti-Muslim Sentiment in the West. Journal of Muslim Minority Affairs 32 (3), S. 293–309. DOI: 10.1080/13602004.2012.727291. Eatwell, Roger (2006): Community Cohesion and Cumulative Extremism in Contemporary Britain. Political Quarterly 77 (2), S. 204–216. Ebner, Julia (2017): The Rage. The Vicious Circle of Islamist and Far Right Extremism. London, New York: IB Tauris. Feldman, Matthew (2012): From Radical-Right Islamophobia to ‘Cumulative Extremism’. Faith Matters (Ed.). London. Online: https://www.faith-matters.org/wp-content/uploads/2012/10/islamophobia.pdf. Fielitz, Maik, Julia Ebner, Matthias Quent and Jakob Guhl (2018): Hassliebe: Muslimfeindlichkeit und Islamismus im Tango, Jena: Institut für Demokratie und Zivilgesellschaft. Halverson, Jeffry; Goodall, J. L. and Steven Corman (2011): Master Narratives of Islamist Extremism. New York: Palgrave Macmillan. Häusler, Alexander (2014): Geliebter Feind? Islamismus als Mobilisierungsressource der extremen Rechten. In: Thorsten Gerald Schneiders (Ed. ): Salafismus in Deutschland. Ursprünge und Gefahren einer islamisch-fundamentalistischen Bewegung. Bielefeld, Germany: transcript (Globaler lokaler Islam), S. 301–318. Holbrook, Donald (2013): Far Right and Islamist Extremist Discourses. Shifting Patterns of Enmity. In: Max Taylor, P. M. Currie and Donald Holbrook (Ed. ): Extreme right wing political violence and terrorism. London: Bloomsbury (New directions in terrorism studies), S. 215–237. Mudde, Cas (2016): On Extremism and Democracy in Europe. London: Routlegde. Wiktorowicz, Quintan (2005): Radical Islam Rising. Muslim Extremism in the West. Lanham: Rowman & Littlefield Publishers. Yardi, Sarita and Danah Boyd (2010): Dynamic Debates: An Analysis of Group Polarization Over Time on Twitter. Bulletin of Science, Technology & Society, 30, Heft 5, S. 316 – 327. Zúquete, José Pedro (2008): The European extreme-right and Islam. New directions?. Journal of Political Ideologies 13 (3), S. 321–344. DOI: 10.1080/13569310802377019.